This is a guest post by Rob Ober, corporate strategist at LSI. Prior to joining LSI, Rob was a fellow in the Office of the CTO at AMD. He was also a founding board member of OLPC ($100 laptop.org) and OpenSPARC. Have you ever seen the old BBC TV show “Connections”? It’s a little old now, but I loved how it followed threads through time, and I marveled at the surprising historical depth of important “inventions.” I think we need to remember that as engineers and technologists. We get caught up in the short-term tactical delivery of technology. We don’t see the sometimes immense ripples in society from our work – even years later. I got a flurry of emails yesterday, arranging an anniversary get-together in August at the Apple campus. Why? It’s the 20th anniversary of the Newton. Ok – so this has nothing to do with LSI really, but it does have a lot to do with our everyday lives. More than you think. So you either know the Newton and think it was a failure (think Trudeau’s famous handwriting cartoon), or you don’t and you’re wondering what the *bleep* I’m talking about. Sometimes things that don’t seem very significant early on end up having profound consequences. And I admit, the Newton was a failure, too expensive and not quite good enough, and the world couldn’t even get the concept of a general-purpose computer in your hand. But oh – you could smell the future and get a tantalizing hint of what it would be. Remember – we’re talking 1993 here. First – why does Rob Ober care? It’s personal. While I didn’t remotely help create the Newton, I did help bring it to market, mature the technology, and set the stage for the future (well – it’s not the future any more – it’s now). I was at Apple wrapping up the creation of the PowerPC processor and architecture, and the first Power Macs. I have a great memory around that time of getting the first Power Mac booted. Someone had the great idea of running the beta 68K emulator (to run standard Mac stuff). That was great, it worked, and then someone else said – wait – I have an Apple II emulator for the 68K Mac. So we had the very first PowerPC Mac running 68K code as a Mac to emulate a 6502 as an Apple II … and we played for hours. I also have a very clear memory of that PowerPC Mac standing shoulder-to-shoulder with the Robotron game in the Valley Green 5 building break room. It was a state-of-the-art video game and looked like this. A guy named Shane Robison pulled me over (yea, the same HP CTO, now CEO of FusionIO) to come fix some things on the super-hush Newton program. In the end, I took over responsibility for the processors, custom chips, communication stacks and hardware, plastics and tooling, display, touch screen, power supply, wireless, NiMH and LiION batteries… A lot. We pushed the limits of state of the art on all those fronts. It was a really important wonderful/terrible part of my career. I learned an amazing amount. If you’re interested in viewing a Newton from today’s perspective, there is a fascinating review here. I wired the Apple campus with wireless LAN base stations (it would be 6 years until Wifi, and 802.11 wasn’t even dreamt up yet) and built the wireless LAN receivers into Newtons, gave them to the Apple execs and set up their mail to be forwarded. You couldn’t even do that on laptops. We could be anywhere in the campus and instantly receive and send emails. More – we could browse the (rudimentary) web. I also worked with RIM (yea – Research In Motion – Blackberry) and Metricom to use their wireless wide area net technology to give Newtons access to email and the Web anywhere in the Bay Area. Quite a few times I was driving to meetings, wasn’t sure where to go, so pulled over and looked up the meeting in my Newton calendar, then checked the address on my browser with MapQuest. 1995. Sound familiar? We also spent time with FedEx pitching it on the idea of a Newton-based tablet to manage inventory (integrated bar code scanner), accept signatures on screen with tablet/pen (even the upside down thing to hand it to the customer), show route maps, and cellularly send all that info back and forth for live tracking. FedEx was stunned by the concept. Sound familiar? I still have the proposal book with industrial designs in my garage. Yes, another Silicon Valley garage. Here’s what it rolled out 10 years later… which is ultimately pretty similar to our proposal. And don’t forget Object Programming. (You remember when OOPS was a high-tech term?) 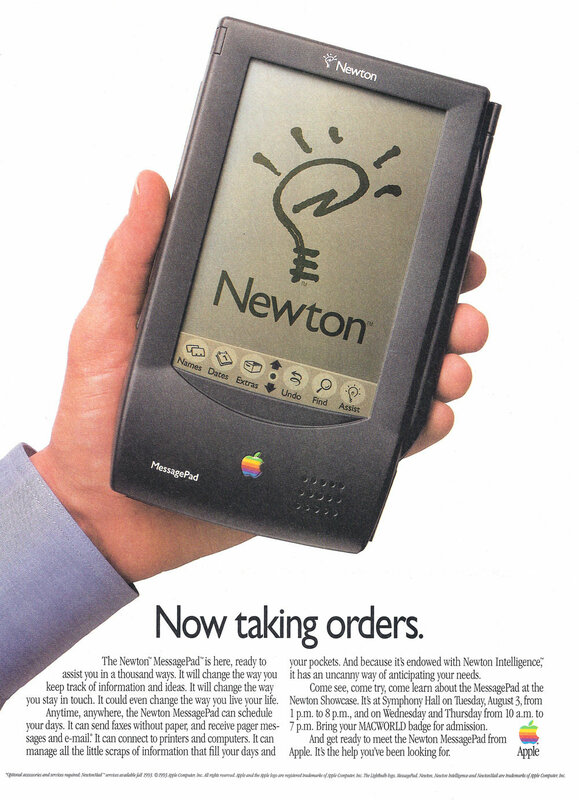 I’m not really a software guy – just not my thing – but I loved programming on the Newton. In 10 minutes you could actually bang out a useful, great-looking program. Personally, I think the world would have been way better off if those object libraries had been folded into the Java object library. Even so, I get a nostalgic feel when I do iOS programming. iPad? Sure. A lot of the same people were involved in a Newton that never saw the light of day. The BIC. Here it is with the iPad. Again – 15 years apart. And then there are the people. Off the top of my head there were founders or key movers of Palm, Xbox, Kindle, Hotmail, Yahoo, Netscape, Android, WebTV (think most set-top boxes), Danger phone (you remember the sidekick? ), Evernote, Mercedes research and a bunch of others. And some friends who became well-known VCs. And I still have a lot of super-talented friends from that time, many of whom are still at Apple. Sometimes things that don’t seem very significant have profound follow-on consequences. I think we need to remember that as engineers and technologists. We don’t see the sometimes immense ripples in society from our work – even years later. Today we’re planting the seeds for all those great things in the future. I admit, the Newton was a failure, but oh – you could smell the future and get a tantalizing hint of what it would be. Remember – we’re talking 1993 here. Rob Ober drives LSI into new technologies, businesses and products as an LSI fellow in Corporate Strategy. Prior to joining LSI, he was a fellow in the Office of the CTO at AMD, responsible for mobile platforms, embedded platforms and wireless strategy. He was a founding board member of OLPC ($100 laptop.org) and OpenSPARC.